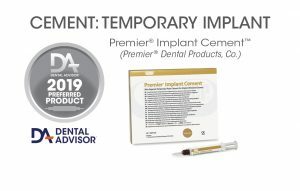 Premier Implant Cement is a eugenol-free, elastic polymer cement indicated for use with long-term temporaries and implant-retained crowns that may require future removal. The cement has a two-stage cure – an initial gel-phase in 2.5 minutes for removal of excess cement and a rigid final set. It is a neutral, light pink gingival color. 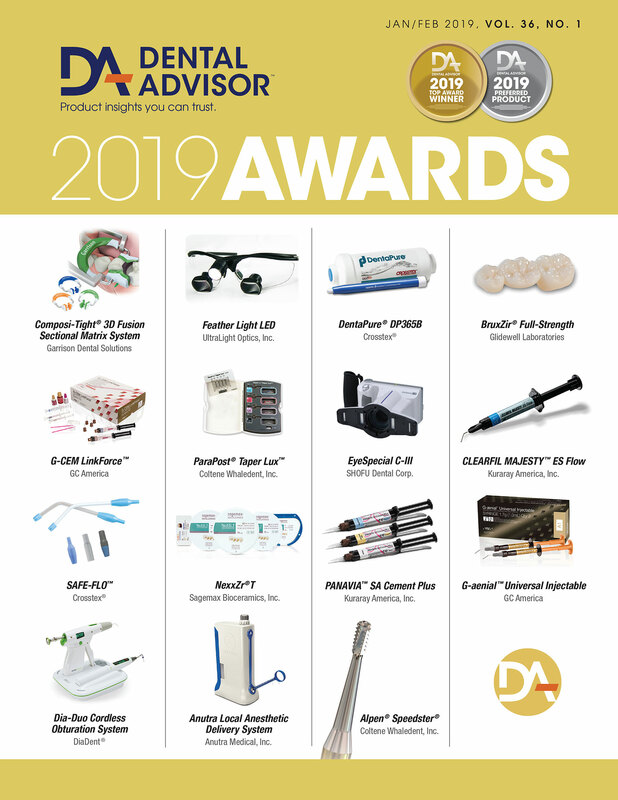 The kit includes a 5-ml dual-barrel, automix syringe, 10 mixing tips and one implant scaler instrument. Thirty consultants evaluated Premier Implant Cement in the cementation of 175 crowns. Premier Implant Cement was highly rated for its easy removal and clean-up of excess cement. The automix feature provides neat, quick mixing and easy placement into the restoration. The light viscosity of the cement allows complete seating of restorations without excessive pressure. Consultants favored the retentive quality of the material, although a few found it difficult to remove restorations when necessary. One hundred percent of the consultants found the cement to be equivalent to or better than their current cement. Sixty percent would switch, while ninetythree percent would recommend Premier Implant Cement. Incorporate a water-based lubricant into the mix to facilitate future removal of the crown. Editors’ Note: The original evaluation was published in THE DENTAL ADVISOR, Vol. 22, No. 1, January/February 2005.